Growing up in small towns in the Midwest, I have to admit, I had great longing to try exotic foods I read about in magazines and books. Often, in those dark days, a single Chinese restaurant in town represented all of Asia, with its Americanized Chop Suey and brown sauced stir-fries. So it was a big deal for me back in the 1980’s when we made the drive to Chicago for a dose of Museums and culture, and got to try Thai food for the first time. It was a revelation—it seemed like all the elements of Chinese food, the soy sauce, the noodles, the tofu, had been charged with electrical current in the form of lime, chiles, coconut and fish sauce. Instead of a salty cornstarch gravy, the familiar bean sprouts and veggies were doused in tangy, fresh dressings, or unctuous coconut milk. I fell hard for Pad Thai, a love affair that continues to this day. From there, branching out to Vietnamese, Malay and Indonesian foods was inevitable for me. It took some time to find authentic restaurants to try, but thanks to some great cookbooks, the flavors invaded my kitchen and found enthusiastic mouths waiting. 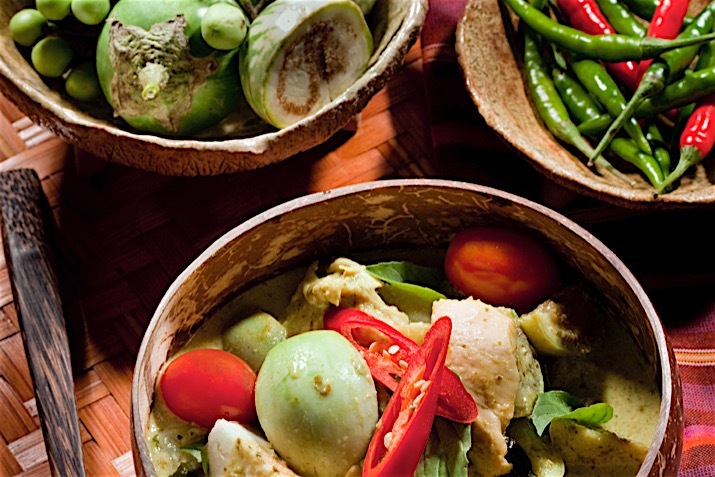 While each of these glorious Southeast Asian cuisines is unique, they share many commonalities including a tropical bounty of ingredients, like citrus, coconut, papaya, and endless varieties of vegetables and herbs. The tropical climate also influences the types of dishes that are prepared, with lighter, leaner dishes that won’t weigh you down on a hot day. Because the region is surrounded by oceans, seafood is plentiful, and the particular flavor of fermented fish sauce, shrimp pastes, and endless seafood spiked curry pastes reflects the bounty. Fish sauce, in particular, is often used in place of salt, and a bottle often sits on the table for seasoning. As odd as it seems to Westerners, it serves a deeper purpose. When fish is fermented and made into a salty liquid, the process breaks down the proteins in the fish, releasing free amino acids. Those amino acids add to the quality of “umami” in the food. Umami is the Japanese word for the fifth taste, which can be described as “meaty” or “mouth-filling.” Because of this, dousing a light bowl of rice noodles and vegetables with fish sauce or soy sauce adds a satisfying mouth-feel that you may not even be aware of. All you might know is that you just want to keep eating! Thai food, my first love, is all about balancing hot, sour, salty and sweet. The heat is provided by chiles, fresh or dried, or already pounded into a curry paste. Sour is provided with limes, lemons and their zests, as well as lime leaf and lemongrass. Lemongrass is a unique, tart flavor, and the woody stalks are often used in dishes where they will be heated or simmered for a long time, a process that would mute the flavor of delicate citrus juice. Tamarind is the pulp of a seed pod, with a flavor both tart and sweet. Salty comes from fish sauce, soy sauce, salted fish, or just salt. Sweetness is added with sugar, although coconut milk and tropical fruits like pineapple or mango also add sweetness. Fresh herbs like cilantro, mint and Thai basil are finishing touches. Vietnamese food is similar, although the rich curries are not as common. Light, citrusy noodle dishes and stir fries are emblematic. The two most popular exports to our shores, Pho and Banh Mie, are both the product of a fusion with the French cuisine of their occupiers. Pho is a slow-simmered, star anise infused broth, which resembles a French style of cooking, but is served by ladling it over thinly sliced meats, vegetables and piles or rice noodles so that the broth poaches the food. Piled high with fresh herbs and chiles, it hardly feels French when it is done. Banh Mie, which are on the way to becoming as common as tacos, are baguette rolls stuffed with fresh and pickled veggies, soy glazed meats, and even pate. Cambodia and Laos feature simpler cooking styles, with less fish sauce and more soy sauce. Similar to Vietnamese, Laotian dishes are often quite simple and home-style. Laos is a sparsely populated country where people forage and capture many wild foods, from bamboo shoots to frogs and eels. Cambodian food is not as chile hot, and less sweet. Lemongrass and galangal are important flavors. Indonesia and Malaysia share an archipelago, where islands large and small bask in the equatorial heat. Centuries of the spice trade have brought ships bearing spices, and the Indian influence brings complex spicing, combined with all the tropical notes of Thai and Vietnamese food. Many different ethnic traditions work side by side in a Malay restaurant, where some dishes seem more Chinese, others more like a blend of India and Thailand. The Philippines are also part of the region, where the foods have less dramatic contrasting flavors, but plenty of tropical excitement. Classic dishes like Beef or pork cooked with vinegar are tangy, but not quite so full of chiles. Crunchy Lumpia rolls are the region’s answer to eggrolls, with many vegetables in the filling, a fine, thin wrapper, and a tangy sweet and sour sauce. A Latin influence also bubbles through the cuisine, with dishes like flan. So pile on the fresh cilantro, mint and basil for a Vietnamese twist to your salad. Drop some red curry and coconut into a soup, and spark it with a little lime. Finley chop lemongrass and mix with soy sauce, and marinate chicken or seafood before grilling to serve on sticky rice, for a Laotian inspired meal. Combine fish sauce and Indian curry spice in your meatballs for a Malay meal, and try stewing meats in a spicy, vinegar infused broth for a taste of the Philippines. You’ll feel more tropical with every spicy bite! Check out Robin Asbell's recipes for Tofu Pad Thai and Vietnamese Pho with Shrimp.